A new book due out this summer looks back in detail at Liverpool Football Club’s almost 120 years of history. The book – ‘Liverpool: The Complete Record’ – has been put together by Arnie Baldursson and Gudmundur Magnusson, the people behind the internet hive of information on all things Liverpool, LFCHistory.net. As users of the LFC History site will be well aware, details of every single Liverpool match over those 120 years can be pulled up in an instant, including line-ups, scorers, attendances and in many cases original match reports. The two have spent years building this information up and have now created a book from the contents of their huge LFC database. Alongside the stats the book will feature a comprehensive narrative history of the club that went from its creation in The Sandon pub to being the Kings of Europe with five European Cups alongside the 18 league titles. The club’s history tends to be told by jumping from formation to the day Bill Shankly started his revolution but this book covers the bits in between in as much depth as the bits we’re all used to hearing. 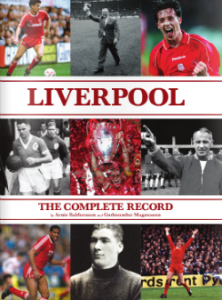 The book is available to order now from http://www.liverpoolbook.com/ where you can also view a preview of a few of the hundreds of pages. An ‘early bird’ discount on the cover price has been extended until later today for those ordering through that website. This is definitely going on my Amazon wish list, just as a reminder as i’ll buy it through their own website, figure they’ll make a bit more cash that way.